A man sees a woman at the door. Woman: Hi, I'm here to paint the exterior of your house as scheduled. Man: But you're a woman! Woman: *Sigh. * Not that worn-out stereotype again. Woman: Women throughout history have fought wars, made profound discoveries, done great things. Man: Ah yes, Marie Curie. Woman: Ah yes, Marie Curie. What about all the others? The unsung heroines? The woman is now seen by herself. As she speaks, illustrations are seen that accompany her speech. Woman: Jocelyn Bell, who jump-started modern astronomy? Somebody else got a Nobel Prize for her work. An illustration is seen in which a small globe is surrounded by two flat circular objects. A ray appears to pass through the globe. Woman: Elizabeth Garrett Anderson, who blazed the trail for women in the field of medicine? She remains unknown. A medicine symbol, showing a snake-like creature curled around a vertical rod, is seen. Woman: Suzanne Vaillancourt, who inspired an international hit song? She ended up homeless. An old-fashioned record player is seen and near it what might be a logo that takes the form of another stylized record player. Woman: I'll be outside getting started. 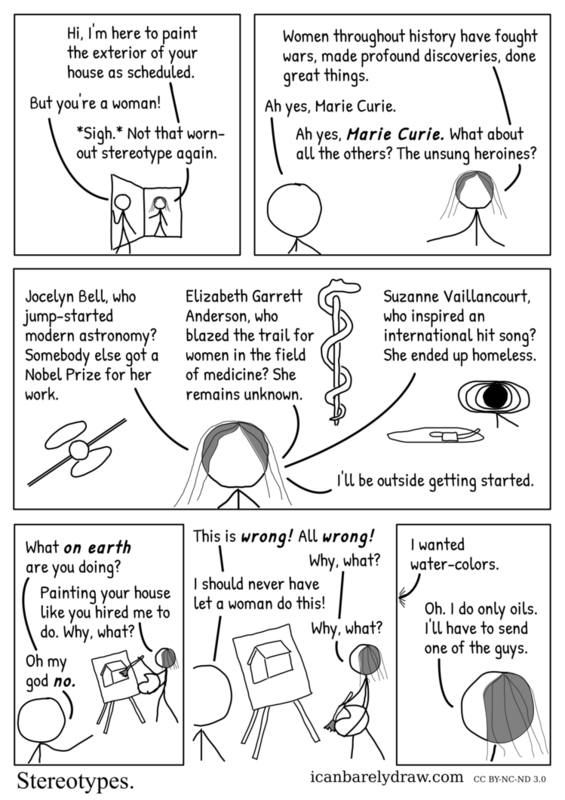 The next panel shows the woman standing at an easel on which a painting of a house can be seen. The woman is holding an artist's palette in one hand and a paintbrush in the other hand. The man stands in the foreground and points towards the woman with one hand. Man: What on earth are you doing? Woman: Painting your house like you hired me to do. Why, what? Man: Oh my god no. Man: This is wrong! All wrong! Man: I should never have let a woman do this! The last panel shows the woman alone in close-up. Off-panel voice: I wanted water-colors. Woman: Oh. I do only oils. I'll have to send one of the guys.